"And let's tell stories. Let's imagine other worlds. 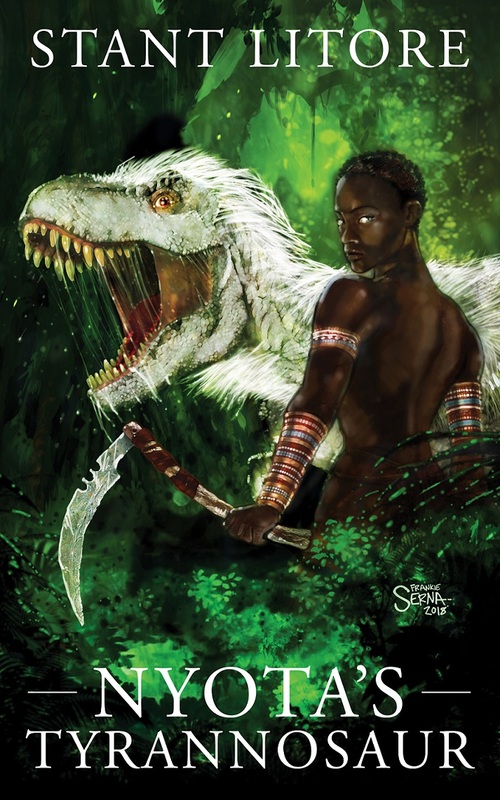 Let's ride some tyrannosaurs! Let's tell stories daringly. That's so important. I think in our culture, the stories we are being asked to swallow so much of the time are not daring stories. They're stories that make us smaller. I want stories that make us bigger—together." Come ride the tyrannosaurs with me! and go behind the scenes as we make amazing stories! I want to write stories that move people's hearts and make them cry and give them hope when hope is hard to have. When I started sharing my novels and short stories, someone asked me what "success" would look like to me. I said, "If I move the hearts of a thousand readers, then my stories have done their work." I want to build a community of 1000 readers in my Patreon family. 1000 tyrannosaur riders, and this becomes a full-time gig (as well as a truly unstoppable dinosaur stampede)! Your membership fees provide my salary as a storyteller; you help make these stories happen. Patreon is a monthly membership that funds me and allows me to keep writing more of the stories you love -- and gives you backstage access into the process behind the scenes. You can join at $5 - or any custom amount you set. 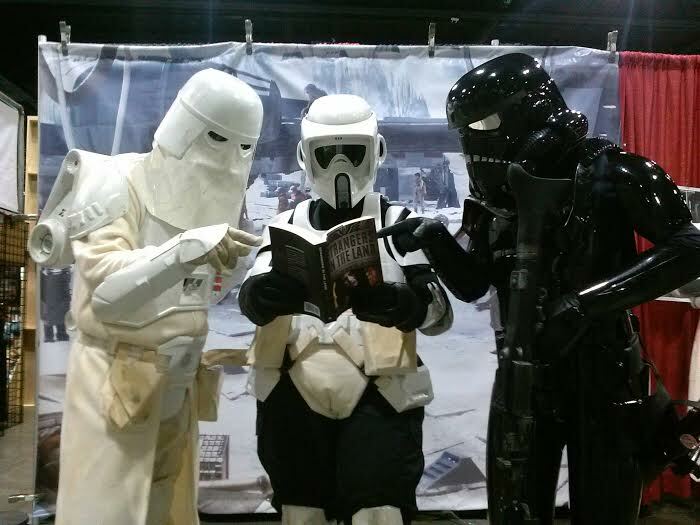 Even fans in a galaxy far, far away love a good new story. What are you waiting for? If you're the kind of reader who has always wished you could sit down on a porch with one of your favorite writers to just listen to the rain and ask them that question you've always had or even just hear them spin out new ideas, then you belong here. This membership is like a book club -- the best book club in the world, not only because you're getting regular new stories, but because you get to chat with the author all along the way. When you become one of my Patreon members, you get backstage access to the stories I'm working on, and your membership funds great new books -- and helps me keep them risky and independent, the way they should be! You can change your Patreon membership level at any time. What's important to me is that you're here, reading and loving the stories and helping us make them! A community of readers: that community is what I share these stories for. You're who I share them with. (Tyrannosaurs do best hunting in packs!) 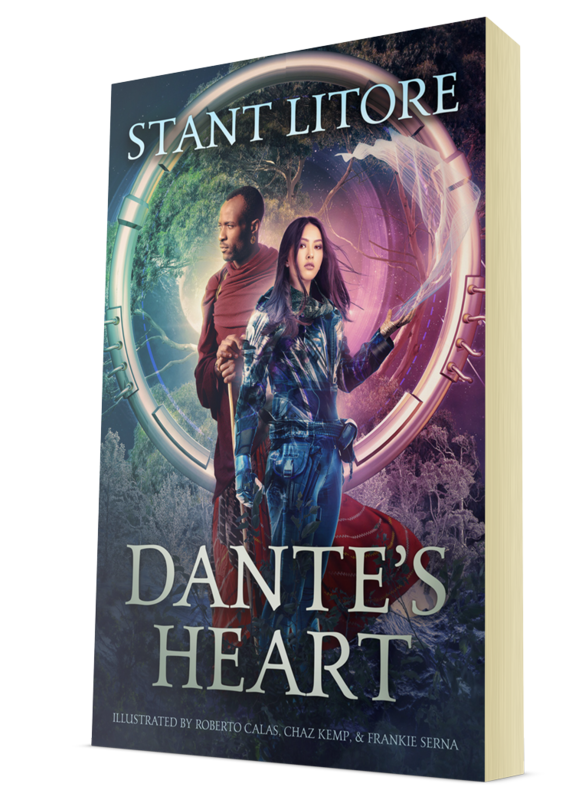 Each day, I know that there is a community of readers waiting for the next story and a check coming at the end of the month, and each day's storytelling counts, and matters to more people than just me: and that lights a good fire in my heart. Thank you so much for being here! Besides creating more stories and art, some of what I make is also put toward the expenses of keeping my disabled daughter Inara safe and well (you can read her story here). I publish mostly for her; her struggle and her victory beats at the heart of everything I write. It's from her that I learn, each day, what it means to live a life of unstoppable hope. Membership dues are monthly, and you can change them at any time. aboard orbital colosseums in the far future. Our ancestors faced the hungry dead. in humanity's struggle against hunger...and the hungry dead. to make first contact, explorers discover a terrible predator. between humanity and the long dark. Fang Yu the cyborg knight and her lover Siwatu the necromancer,and Azar Almasi the intergalactic geneticist (and deity) as they search the universe for the secret of violence. Kindle editions of all my books! Early access to read each new story before it gets released to the public! An early look at my projects -- with patron-only, exclusive access to sample chapters/scenes and "behind the scenes" posts about projects in progress! Be heard: Offer your input on covers, titles, new ideas; I often check in with my readers! Want a signed copy of one of my books? A couple of times a year, I'll do a ship-out! Just let me know you're interested. This is a really significant number to me. I want to write stories that move people's hearts and make them cry and give them hope when hope is hard to have. When I started sharing my novels and short stories, someone asked me what "success" would look like to me. I said, "If I move the hearts of a thousand readers, then my stories have done their work." I want to build a community of 1000 readers in my Patreon family. 1000 members, and this becomes a full-time gig.